It is a warm, sunny day in Southern California. and at the Vic Braden Tennis College in Coto de Caza, 60 miles southeast of Los Angeles, a few dozen students are watching a most peculiar exhibition. At one end of a tennis court, a ball machine flings one ball after another across the net. Seated on a chair on the opposite side, a short, chubby man, racquet in hand, rises to meet each one. hitting it squarely with a looping forehand. Thwack. Thwack. The balls whiz back over the net. landing just inside the base line. Victor Kenneth Braden. 60. has a point to make. "See what you can do when you bend your knees and then lift with your thighs as you hit the ball?" he asks his students. The imagery is vivid, but one woman remains dubious. "My knees don't bend that much." she says. "That's strange." Vic responds impishly. "Didn't I see you sitting in the restaurant last night? How did you get into that position? Did the waiter hit you in the back of the knees?" The woman nods, getting the point, laughing. Her classmates laugh, and Braden joins in. Laughter, in fact, is an essential part of the curriculum at the tennis college. where every year several thousand adults take three-tofive-day courses that cost S100 daily. It erupts regularly from the classroom during Braden's unique lectures, which combine show biz, science. humor and psychology. It rings out on the 17 courts and the 18 teaching lanes equipped with ball machines-and in the four video rooms. where students guffaw as they view tapes of their own just completed drills. Even the pro shop is involved. It carries T shirts bearing the slogan LAUGH AND WIN. Laughing all the way, Braden has become a celebrity in the sports world. Jack Kramer, the 1947 Wimbledon champion, calls him "the world's best all-around tennis coach," who can improve the game of anyone "from a beginner to a champion." Braden was featured on the cover of the August issue of Tennis magazine. In television commercials he is touting Tennis Our Way, a videotape he made with Arthur Ashe and Stan Smith, and millions of sports fans have chuckled at his commentaries on cable and network TV. 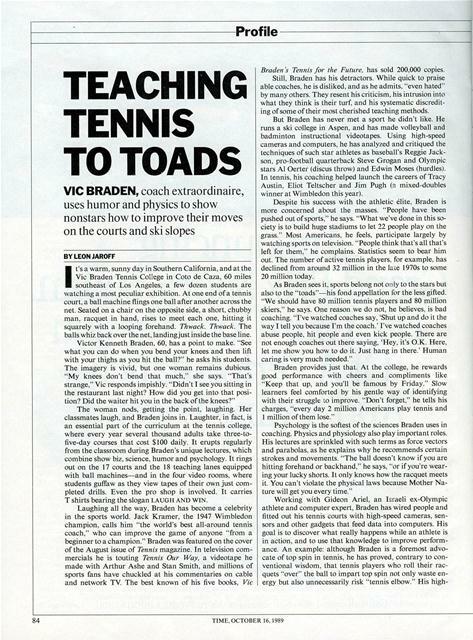 The best known of his five books, Vic Braden :r Tennis for the Future, has sold 200.000 copies. Still, Braden has his detractors. While quick to praise able coaches, he is disliked, and as he admits. "even hated" by many others. 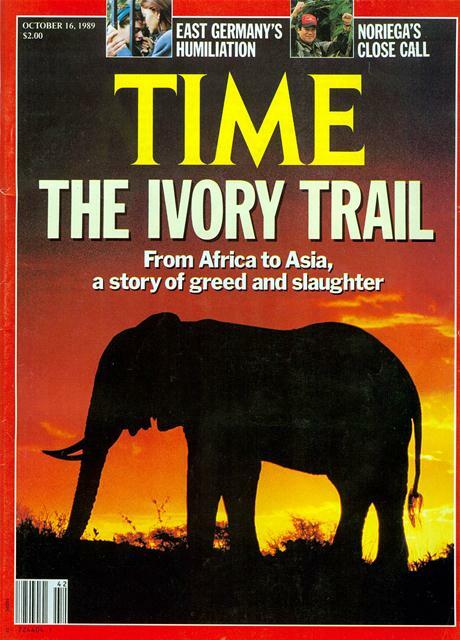 They resent his criticism, his intrusion into what they think is their turf, and his systematic discrediting of some of their most cherished teaching methods. But Braden has never met a sport he didn't like. FIe runs a ski college in Aspen, and has made volleyball and badminton instructional videotapes. Using high-speed cameras and computers, he has analyzed and critiqued the techniques of such star athletes as baseball's Reggie Jackson, pro-football quarterback Steve Grogan and Olympic stars Al Oerter (discus throw) and Edwin Moses (hurdles). In tennis, his coaching helped launch the careers of Tracy Austin. Eliot Teltscher and Jim Pugh (n mixed-doubles winner at Wimbledon this year). Despite his success with the athletic elite, Braden is more concerned about the masses. "People have been pushed out of sports." he says. "What we've done in this society is to build huge stadiums to let 22 people play on the grass." Most Americans. he feels, participate largely by watching sports on television. "People think that's all that's left for them." he complains. Statistics seem to bear him out. The number of active tennis players. for example, has declined from around 32 million in the lace 1970s to some 20 million today. As Braden sees it, sports belong not oily to the stars but also to the "toads"-his fond appellation for the less gifted. "We should have 80 million tennis players and 80 million skiers." he says. One reason we do not, he believes, is bad coaching. "I've watched coaches say, 'Shut up and do it the way I tell you because I'm the coach.' I've watched coaches abuse people, hit people and even kick people. There are not enough coaches out there saying. 'Hey, it's O.K. Here, let me show you how to do it. Just hang in there.' Human caring is very much needed." Braden provides just that. At the college, he rewards good performance with cheers and compliments like "Keep that up. and you'll be famous by Friday." Slow learners feel comforted by his gentle way of identifying with their struggle to improve. "Don't forget," he tells his charges. "every day 2 million Americans play tennis and I million of them lose." Psychology is the softest of the sciences Braden uses in coaching. Physics and physiology also play important roles. His lectures are sprinkled with such terms as force vectors and parabolas. as he explains why he recommends certain strokes and movements. "The ball doesn't know if you are hitting forehand or backhand." he says. "or if you're wearing your lucky shorts. It only knows how the racquet meets it. You can't violate the physical laws because Mother Nature will get you every time." speed film shows that the ball is in contact with the strings for only four milliseconds and is well on its way to the net before the player even begins rolling his racquet. "Anyway." says Braden, "if the player really hit over the ball. he would drive it into his foot." To impart top spin, he Explains, the player needs only to swing from low to high. bringing the face of the racquet to a vertical position as it meets the ball. The third of seven children of an impoverished Appalachian coal miner who moved north to seek work, Braden was born and raised in the industrial town of Monroe. Mich. On his way to play football one day. Vic. then 11. passed the local tennis courts just as someone opened a can of balls. "You could hear the fizz," he recalls. "I could smell the rubber. It was an amazing kind of olfactory thing. I made up my mind I wanted one of those things." Next day he returned to the courts and was caught pilfering balls that sailed over the fence by Lawrence Alto, Monroe's recreation-tennis director. "You're going to jail," said Alto menacingly, "or you're going to learn this game." Braden opted for lessons. They took. That summer he captured his first tournament. and he went on to win the Michigan high school tennis championship. He also excelled in other sports. He was quarterback on the Monroe High football team, captain of the basketball team and city badminton champion to boot. Even then. Braden had the temerity to question his coaches' instructions. As a local newspaper columnist wrote. "Vic Braden is the best tennis player ever to come out of Monroe, but he was pretty hard to handle." His penchant for analysis surfaced early. He made pinholes in 3-by-5 cards, then peered through them at athletes in action. "I was isolating segments of their bodies." he explains. "the hips, the thighs. to see how they moved during play." 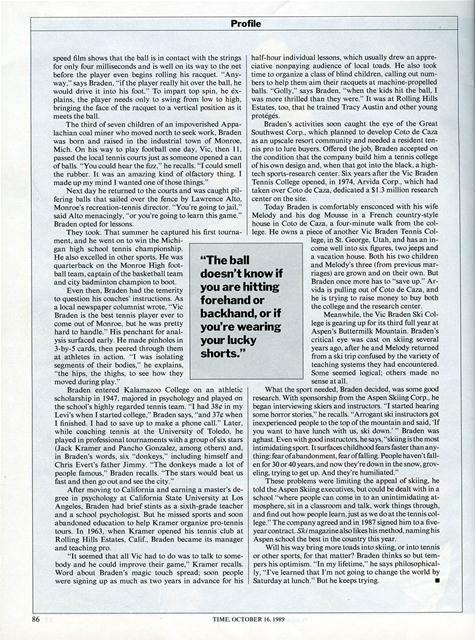 Braden entered Kalamazoo College on an athletic scholarship in 1947, majored in psychology and played on the school's highly regarded tennis team. "I had 38c in my Levi's when I started college," Braden says. "and 37c when I finished. I had to save up to make a phone call." Later, while coaching tennis at the University of Toledo, he played in professional tournaments with a group of six stars (Jack Kramer and Pancho Gonzalez, among others) and, in Braden's words, six "donkeys," including himself and Chris Evert's father Jimmy. "The donkeys made a lot of people famous," Braden recalls. "The stars would beat us fast and then go out and see the city." After moving to California and earning a master's degree in psychology at California State University at Los Angeles, Braden had brief stints as a sixth-grade teacher and a school psychologist. But he missed sports and soon abandoned education to help Kramer organize pro-tennis tours. In 1963. when Kramer opened his tennis club at Rolling Hills Estates, Calif., Braden became its manager and teaching pro. half-hour individual lessons. which usually drew an appreciative nonpaying audience of local toads. He also took time to organize a class of blind children, calling out numbers to help them aim their racquets at machine-propelled balls. "Golly," says Braden, "when the kids hit the ball, I was more thrilled than they were." 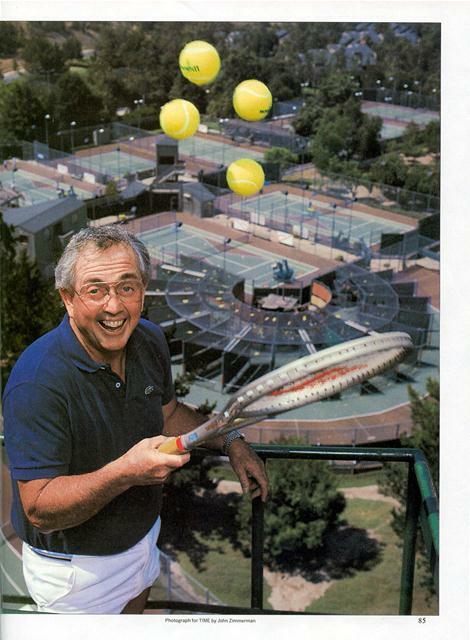 It was at Rolling Hills Estates, too, that he trained Tracy Austin and other young protegds. Braden's activities soon caught the eye of the Great Southwest Corp., which planned to develop Coto de Caza as an upscale resort community and needed a resident tennis pro to lure buyers. Offered the job, Braden accepted on the condition that the company build him a tennis college of his own design and, when that got into the black. a hightech sports-research center. Six years after the Vic Braden Tennis College opened, in 1974. Arvida Corp., which had taken over Coto de Caza, dedicated a S 1.3 million research center on the site. Braden once more has to "save up." Arvida is pulling out of Coto de Caza, and he is trying to raise money to buy both the college and the research center. Meanwhile, the Vic Braden Ski College is gearing up for its third full year at Aspen's Buttermilk Mountain. Braden's critical eye was cast on skiing several years ago, after he and Melody returned from a ski trip confused by the variety of teaching systems they had encountered. Some seemed logical: others made no sense at all. What the sport needed, Braden decided, was some good research. With sponsorship from the Aspen Skiing Corp., he began interviewing skiers and instructors. "I started hearing some horror stories." he recalls. "Arrogant ski instructors got inexperienced people to the top of the mountain and said. 'If you want to have lunch with us, ski down."' Braden was aghast. Even with good instructors, he says, "skiing is the most intimidating sport. It surfaces child hood fears faster than anything: fearof abandonment. fear of falling. People haven't fallen for 30 or 40 years, and now they're down in the snow, groveling, trying to get up. And they're humiliated." These problems were limiting the appeal of skiing, he told the Aspen Skiing executives, but could be dealt with in a school "where people can come in to an unintimidating atmosphere, sit in a classroom and talk, work things through. and find out how people learn, just as we do at the tennis college." The company agreed and in 1987 signed him to a fiveyearcontract. 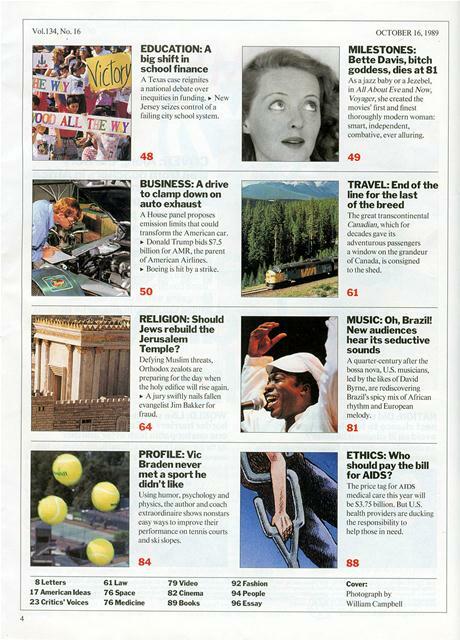 Ski magazine also likes his method, naming his Aspen school the best in the country this year. "The ball doesn't know if you are hitting forehand or backhand, or if you're wearing your lucky shorts." Generated on 4/22/2019 1:52:22 PM (PST) ADI/HQ/GBA/2019/ARIELCLOUD/v3.0.2018.0126.